A demo for students in a beginning Icon workshop in Seattle, Washington. Due to an increase in commissions and upcoming shows I will not be offering any workshops in 2018. 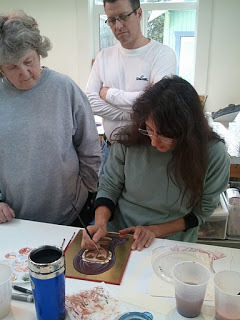 If you are interested in learning how to use egg tempera or write an icon please feel free to contact me and I will add your name to my mailing list for notices when a workshop is available.